Browsing for kitchen gadgets one day at amazon.com and came across this mini cheesecake pan. Crazy for anything "mini", I immediately ordered one.... and then it sat.... for over a year...untouched... in my pantry. Decided to make a cheesecake for a family gathering the other day, and while reaching for my springform pan, I found my mini cheesecake pan. I had forgotten that I had it. Using an electric mixer, blend softened cream cheese, egg, vanilla, sugar, lemon juice and lemon zest together in a medium bowl. Spoon cream cheese mixture evenly into the twelve cups of the pan (only 1/2 full). Bake 12-14 minutes. Remove from oven and place on rack to let cool for 15 minutes. Use sharp knife to loosen sides. 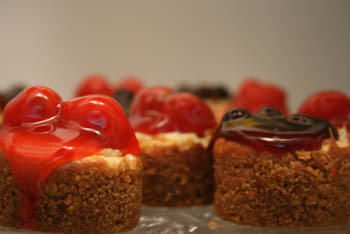 Remove cheesecakes from pan and cool completely. Top with favorite toppings (I used cherry and blueberry pie filling). Refrigerate until ready to serve. This page contains all entries posted to veronicafung.com in July 2007. They are listed from oldest to newest.